It takes a distinct type of person to disregard their instincts and step outside of a plane at 14,000 ft. It takes courage. But you don’t have to jump without knowing what to expect first. Expect sensory overload as your mind and body battle against all your instinctual urges. This challenge is immense, but the reward is beyond reason. Harnessed by modern equipment to an experienced and certified jumpmaster, you jump out of the aircraft. We hope you like falling with nothing to hold onto, because for 60 seconds that is your life. Your entire life is reduced to a single adrenaline rush, a few screams, an amazing view and a big smile as you fall at 120 mph. You will arrive at the dropzone, fill out a waiver, go through a quick 10 minute training session and get harnessed before walking to the plane. After a 10 minute flight to altitude riddled with combating emotions of fear, excitement and nervousness; you will nudge, likely hesitantly, towards the door before being thrown out! Keep your head up, smile big for the camera, enjoy the scenery and take in an experience like no other. After your adrenaline-pumping freefall, you will float safely back to the ground under the canopy for about 5-7 minutes. While this is typically the more relaxed portion of the jump, our instructors are prepared to customize the flight to ensure it’s as wild or mild as you would like. For what it’s worth, skydiving isn’t exactly ‘unsafe’ despite the common misconception. You are more likely to die of a fireworks discharge or a flood than on a tandem skydive. Nevertheless, Skydive Georgia takes every available precaution to ensure your jump is rid of any unnecessary risk. Each tandem instructor is licensed by the United States Parachute Association (USPA), having a minimum of 3 years experience, 500 jumps and a USPA Master Skydiving license. 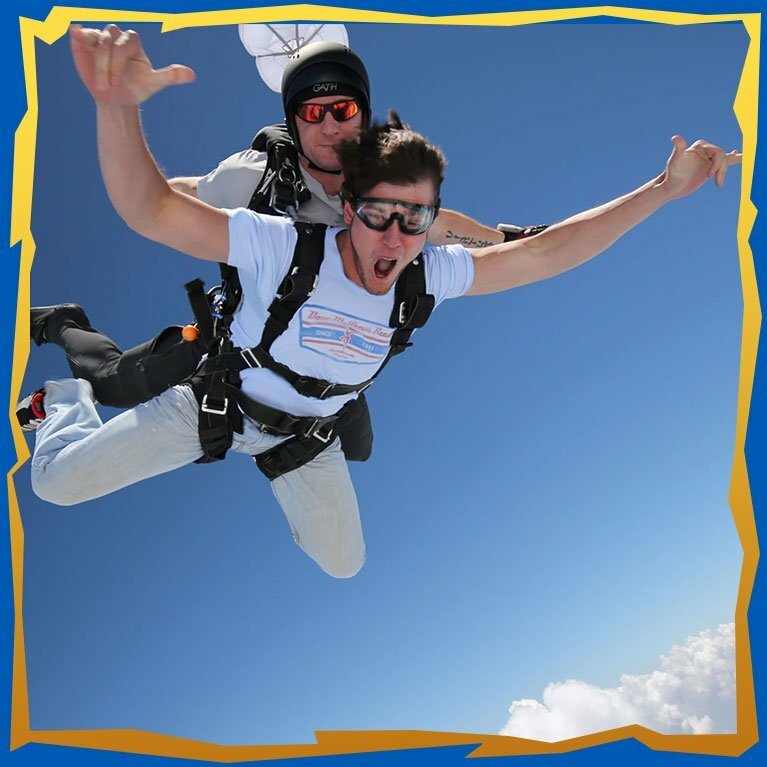 However, most of our instructors have been in the sport long enough to accrue thousands of skydives. Our modern equipment is constantly cycled to ensure the latest and safest model is being used. Each rig consists of a main and reserve parachute with the added precaution of an Automatic Activation Device (AAD). If any problem occurs with the main parachute, the instructor will cut it and deploy the reserve, which is packed by a F.A.A licensed Master Parachute Rigger every 180 days. If worst comes to worst and neither parachute deploys by 1,650 ft, the AAD device will activate deploying the reserve parachute. Each instructor undergoes vigorous training to ensure they are prepared to handle any obstacle in flight; this along with natural experience is the perfect recipe for a smooth and happy jump. Tandem skydive with Skydive Georgia in Cedartown to experience a thrill like no other from 14,000 ft and become a part of the family we have built out here. For 20+ years, Skydive Georgia has ensured the happiness of hundreds of thousands of jumpers who decided to take the plunge with us. We have, by far, the most experience in the area, refreshed with a maintained facility, equipment and aircraft. 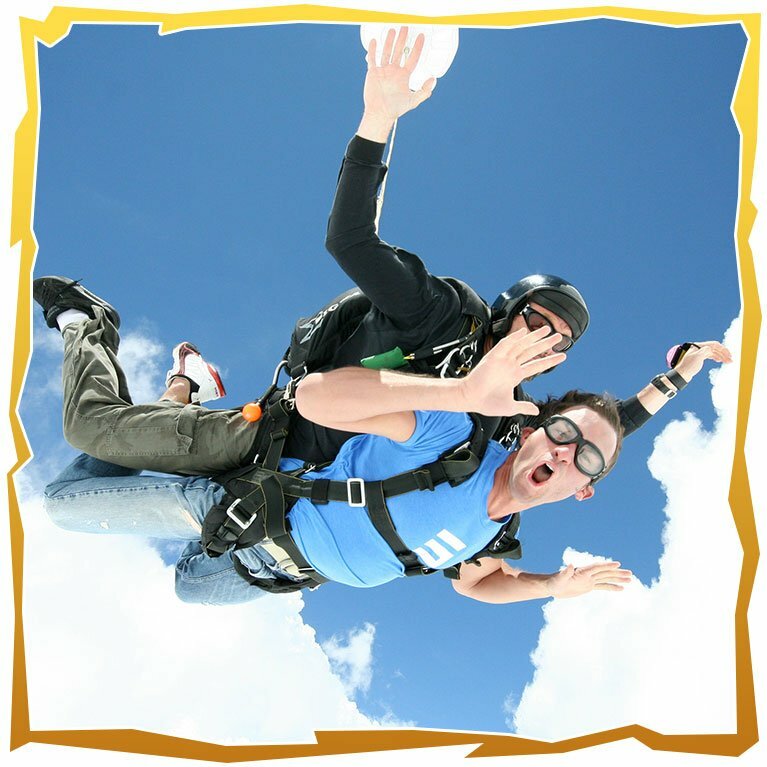 We invite you to take part in the craziness that takes place here each day by committing to your first tandem jump! So again, we ask you, why jump out of a perfectly good airplane? If you don’t know by now, you should probably just give us a call. 770.684.3483. Super-fast Turbo-prop engine – Get to 14,500 ft. in as little as 10 minutes! Seats up to 23 jumpers – More friends, more fun!